The SAILOR 900 VSAT High Power is a direct evolution of the innovative SAILOR 900 VSAT platform, which has become a benchmark for quality and high performance. While one meter Ku-band antennas with 8W RF configurations are now a de-facto standard for global Ku-band networks, the ever-increasing demand for more bandwidth and higher data throughput also for the uplink to the satellite has triggered demand for antenna systems with higher RF power. To meet the challenge, Cobham SATCOM has employed its proven engineering method to design and specify a new 20W extended frequency BUC, with focus on performance and reliability. Because it is an in-house design, Cobham SATCOM has ensured that all environmental challenges are met. With this advanced new BUC, the SAILOR 900 VSAT High Power is verified to provide reliable operation downlink and uplink even in regions with high temperatures. The SAILOR Ku-Band VSAT platform makes this easier and less costly as it can operate two antenna systems on a single modem without the need for an extra box to manage the connection to the VSAT modem. The two SAILOR antenna controllers manage the connection between satellite and satellite router fully automatically and the switch-over happens in just 20 milliseconds. New Ku-band and Ka-band high throughput satellites (HTS) are coming online. All SAILOR Ku-Band VSAT has been tested to work on HTS services. Additionally, even with its unique higher power BUC, the SAILOR 900 VSAT High Power is prepared for conversion from Ku- to Ka-band operation should the project demand it. 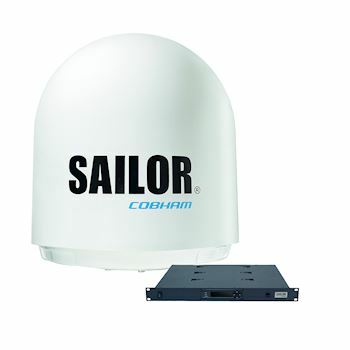 State-of-the-art electronics, and a reflector dish and radome tuned for optimum performance on both Ku- and Ka-band frequencies ensure that SAILOR 900 VSAT High Power is an incredibly flexible solution.